Valued-price economy can sleeve coolies offer a non-slip grip and is great for the water, picnics, parties, tailgates, and all other events or outings. 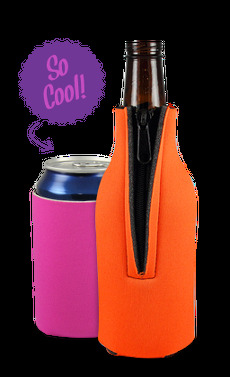 This can sleeve koozie features an open end bottom for easy slip on and slip off. Custom can sleeve koozies can boost your brand with a company logo or slogan and conveniently collapses flat, allowing you to fit it virtually anywhere. Designed as a 12 oz. can sleeve and made with premium 1/8" thick, high-density, open cell foam, keeping your drink colder, longer.